It is NOT a Secret — 2 Basic Steps to Weight Loss & Fitness Success! Do you want Effective Weight Loss? 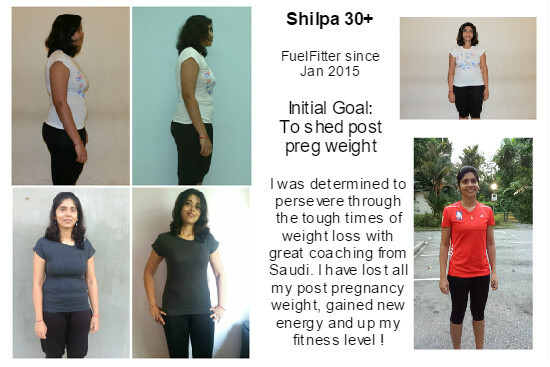 How did our FuelFitter Shilpa, a full time working mother, (pictured below) from Fuel Fit Team Punggol achieve effective weight loss? An American motivational speaker Zig Ziglar once said, “If you aim at nothing, you will hit it every time.” And each of us knows from our own experience that he is right. The general flow of human life tends to be towards ease and comfort. One day flows into the next, and many of us never quite get around to turning our good intentions into reality. Sounds like YOU? Those ‘good intentions,’ while no doubt admirable, tend to remain unrealized mainly because they are too vague. Remember : Vague ideas are impossible to focus on and aim for; they are moving targets. Do you have moving targets in your life? Perhaps you want to eat a more healthy diet or lose the additional weight that has crept upon you while you were busy with work and family over the past years. Maybe you just want to establish a regular workout routine and stick with it this time.The keys to your success are two-fold: Steady the Target and Create Momentum. What kind of changes do you want to make in your diet? It is hard to change lifelong habits on your own. You need radical motivation that comes from involving others in your efforts. Setting deadlines, making commitments, getting your partner to join you in a fitness routine and entering contests all provide an external motivation that will carry you through even the toughest temptations. And once you get started, you will find that once the Momentum Principle kicks in and it becomes easier and easier to keep going. You can make that moving target come to a screeching halt and blast the bull’s eye right out of it by taking a few minutes to write down what you want. Don’t make your goals too broad; be specific. And then begin brainstorming ways to get others involved with you; that will provide your momentum. Success is within your reach. You can do this! Oh, and remember, Fuel Fit is here to help you the entire way! If you will like to understand more about us or want to try out our classes, click here to find out more about our 1-Week Unlimited Workouts Pass *! * The 1-Week Unlimited Workouts Pass is only available to non-Fuelfitters. ← Celebrating Woodlands Fun : It is not just about Losing Weight!